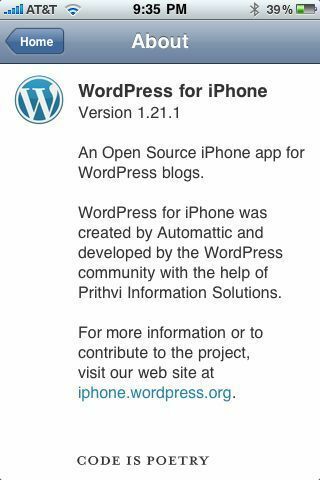 WordPress 1.21.1 for the iPhone has just been released for the latest iPhone O/S. This release fixes a bunch of bugs that were introduced when iPhone 3.0 was released. I do personally feel that there were a bunch of issues that cropped up in the previous version of the app due to the release of wordpress 2.8 but all of those have been fixed with this release. With this release, I can now access the blog account details page, affix categories on any posts and type while in the landscape orientation, among other things. I do wish that in the future versions of this app I would have better controls on the formatting of text and better multimedia management since the iPhone takes videos this time around. This version is a must downlaod if you use wordpress as you blogging platform and you have an iPhone or an iPod Touch. With this release, wordpress showed that code is indeed poetry.